THE HUSK OR HULL: is a papery outer covering that is always removed. Many grains fall out of their husks when they are harvested. A few grains (such as barley and buckwheat) have very hard hulls; these must be ground away. Grains that have the husk or hull removed are considered whole grains (and will still sprout) if the bran layers and the germ are intact. BRAN LAYERS: Each seed is protected by an outer coating that is several layers thick. The bran layers are rich in fiber, vitamins and minerals. 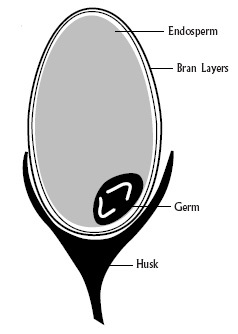 GERM OR EMBRYO: This is the part of the seed that becomes a new plant if it is allowed to sprout. The tiny germ contains protein, essential fatty acids, vitamins and minerals. If the seed is broken open, the germ begins to turn rancid almost immediately, so it is usually removed when grains are ground into flour. ENDOSPERM: The largest part of the seed feeds the growing embryo if it is allowed to sprout. It is virtually all starchy carbohydrates. The calorie-rich endosperm is what we eat when grains are refined to remove the coarse outer covering (the fiber) and the nutrient-rich but quick-spoiling germ -- to make flour, corn meal or white rice.